Update: A new PPA comes with fixed Ubuntu 10.10 Linux Sopcast Player packages so use that instead of this manual fix. SopCast Player is a Linux GUI front-end for the p2p streaming technology developed by SopCast. SopCast can play various TV channels online (watch football games, HBO, AXN Movie and so on) for free. Besides the default channel list, you can find many more (local or international) channels by simply searching Google. 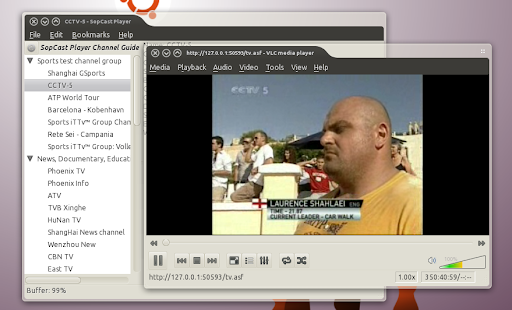 But thanks to a fix by ilabor, you can easily get Linux Sopcast Player to start in Ubuntu 10.10 (with VLC 1.1.x). 64bit: sp-auth, sopcast-player. If you get an error about a missing lib32stdc++ dependency (only if you get such an error! ), install lib32stdc++5 too. If it still doesn't work, there's nothing I can do as this package seems to create some issues on 64bit (but it works just fine on 32bit). Please note that the libstdc++5 download started quite slowly for me but the download eventually worked so that might be the case for you too. At this point, SopCast player should start (if it doesn't, reinstall it) but the "show controls" and fullscreen don't work. To fix this too, in the Preferences, on the "Player" tab, select "Use External Player" and under "Command" enter "vlc" (without the quotes). Thanks to somloirichard.hu for the info and ilabor for the fix!